In the Muddus/Muttos national park there is a summer trail system approximately 50 km long. In wintertime there are no marked trails, but the iced-over wetlands and snowclad forests attract many skiers who ski between the cabins that are open in winter. In summertime, stretches of the Muttosbálges trails cross dry forest ridges and marshes, and follow plankways. 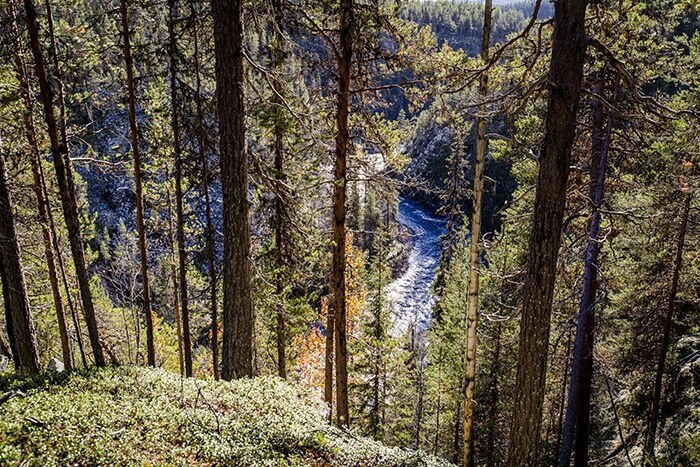 For example, you hike along the dramatic river Muttosädno, past waterfalls and ravines and through old-growth forest. In wintertime you can also enter Muttos from the north and ski over the wetland areas which in summer are passable only for those who know their way. For you who bring a tent there are good tent pitches all over the area. Not far from Muddusagahtjaldak, the waterfall cabin, there is a prepared tent site with toilet and woodshed. There are also several picnic sites along the trail with a supply of firewood, toilet and fireplaces. Click on the map above to enlarge it. Map: Lisa Wallin. All the cabins in Muddus/Muttos are open year-round! You can find more information about what it costs to stay in the cabins and how to pay for your accommodation here.